Two McGill University research projects aimed at helping farmers mitigate greenhouse gas emissions will receive nearly $3 million in funding from the Government of Canada, federal officials announced. 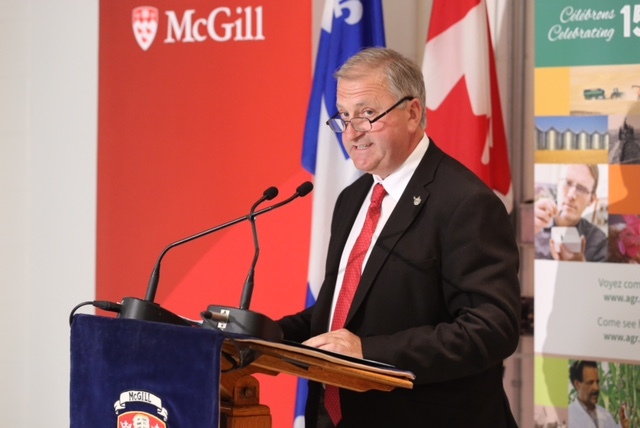 Parliamentary Secretary to the Minister of Agriculture and Agri-Food, Jean-Claude Poissant, and Francis Scarpaleggia, Member of Parliament for Lac-Saint-Louis, made the announcement today at McGill’s Macdonald Campus in Ste. Anne de Bellevue, Que. The McGill-led projects will investigate novel ways in which emissions can be reduced through improved water and biosolids management. The funding is being provided under the Agricultural Greenhouse Gases Program, which supports projects that will create technologies, practices and processes that can be adopted by farmers to mitigate greenhouse gas emissions. A project led by Prof. Grant Clark, Department of Bioresource Engineering, will receive more than $1.3 million to research best management practices for the use of municipal biosolids, a by-product of wastewater treatment plants, as a crop fertilizer. Biosolids contain significant quantities of organic and inorganic nitrogen, as well as other plant nutrients. A project led by Prof. Chandra Madramootoo, Department of Bioresource Engineering, will receive more than $1.6 million to study the effects of different water management systems in Eastern Canada. The project aims to provide information on water-management practices that reduce greenhouse gas emissions while increasing agricultural productivity. Both projects involve collaboration with other institutions. These include Dalhousie University, University of Alberta, University of Calgary, University of Guelph and University of Saskatchewan; Agriculture and Agrifood-Canada research stations in Harrow, Guelph and Saskatchewan, and various industry partners.